Seagoing ships with outriggers are a rarity. 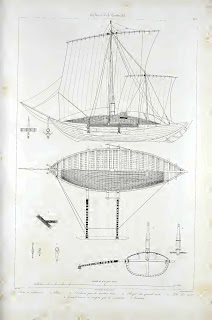 If one defines “ships” as “(floating mobile nautical) structures which constituted significant elements in the economies of the societies which built and operated them” (Basil Greenhill, in The Earliest Ships: The Evolution of Boats into Ships), then a few of the larger traditional single-outrigger canoes of Oceania would qualify, but based on their size, burthen, and the fact that they are “canoes,” most modern observers would still call them “boats” without hesitation. Some motorized bancas of the Philippines might be (just) large enough to be thought ship-like by some, but no one of these double-outrigger vessels would qualify on the grounds of economic significance. The yathra dhoni of Sri Lanka and the Coromandel Coast on India, then, may be the only traditional outrigger vessel that was undeniably a “ship.” Large and burthensome enough so as not to be mistaken for a boat, and used as a cargo carrier on both coastal and short oceanic voyages, the single-outrigger yathra dhoni (also spelled yatra dhoni, and also known as the maha-oruwa or maha oru, meaning “big outrigger canoe”) was in use for centuries – possibly thousands of years – and remained in common use into the early twentieth century. 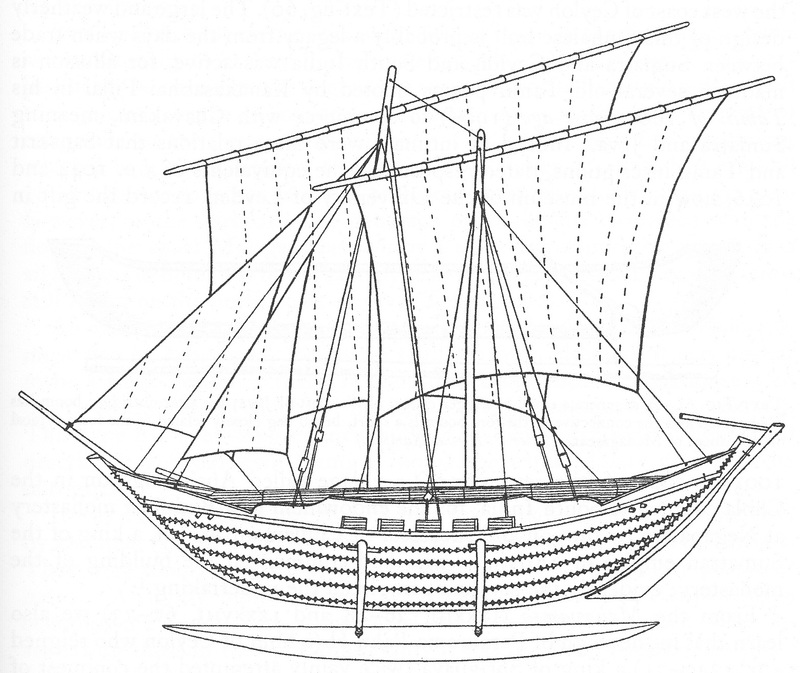 Outrigger ships in Sri Lanka were noted by Strabo (65 BCE-19 CE) and Pliny (23-79 CE), and if these were not yathra dhonies per se, they were probably their direct ancestors. A temple carving in Borobudur, Java, dated to the 8th to 10th century CE, shows “the arrival of Aryan emigrants to the Indonesian Islands” (Vitharana) in an outrigger vessel with features similar to the yathra. (The original Aryans, however, were from the area that is now northern India, not Coromandel or Sri Lanka.) Near the end of their history, yathras were known to be trading as far as the Moluccas, so their earlier use transporting Aryans or their neighbors to Java (which, like the Moluccas, is in Indonesia, but closer to India) seems credible. Most yathras were 50 to 60 feet LOA with a main hull beam of 12 to 15 feet. The largest were 100 feet long with a 20 foot hull beam. Vitharana states that they were 10 to 15 feet in height, although it is unclear what points of measurement are implied. Cargoes ranged from 25 to 75 tonnes, with 50 being typical. The main hull was double-ended, with slack bilges, full midsections, and a slightly hollow entry. 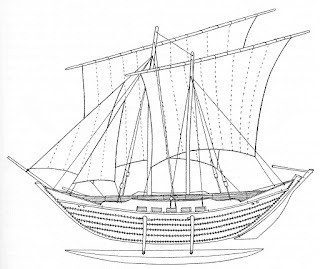 The outrigger varied in length, from about a third (Paris) to well over two-thirds (Vosmer’s drawing of a highly detailed model built in the former yathra center of Dodanduva, Sri Lanka, that is widely accepted for its authority) the length of the main hull. It was always mounted on the port side, fastened directly to substantial, downward-curving booms that extended right through the main hull at the level of the deck beams. (One simplified model exists with the outrigger to starboard, but this model lacks a rudder and may represent a different vessel type, or the difference may be due to imprecision on the modeler’s part.) Guys leading diagonally from the main hull to the outer ends of the outrigger booms helped stabilize the outrigger float fore-and-aft. The yathra’s rudder followed the curve of the sternpost. The rudder on the Dodanduva model is enormous and wide, but other reliable sources show rudders of more graceful shape and conventional proportions. From this, it appears that rudders were fitted in a range of sizes and styles. 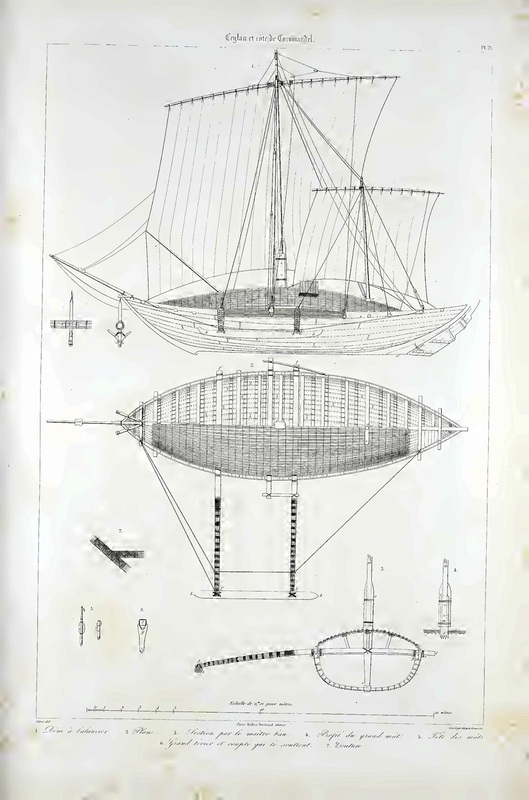 Vitharana refers to a “secondary rudder to act as a leeboard … in the region of the main mast touching the water on the starboard side,” but in no models or drawings that I know of does such a feature appear. A leeboard would appear to be unnecessary, since the hull was built on a keel that provided significant lateral plane to resist leeway. 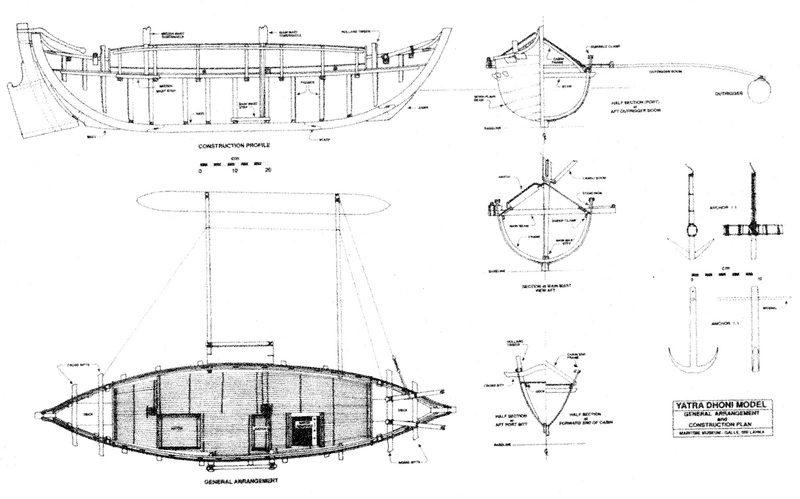 Some models and drawings also show a “gripe” at the bow and a skeg at the stern (upon which the rudder’s lower end was hung), both of which added to the lateral plane and directional stability. Two bulkheads divided the hull into three sections: small bow and stern compartments, the use of which I have not found described, and a large cargo hold between them. Much of the deck was covered by a light, removable deckhouse roofed with split bamboo, leaving only narrow walkways along the sides for the crew to move fore and aft. Sliding cargo hatches were offset to starboard, and a simple cargo handling crane was located to port. In order for this to come in use, lighters – probably small dugout canoes – must have come alongside the main hull between the outrigger booms. But because the vessel would sit upright on a beach, supported by the outrigger, it may be that loading and unloading was often done on land. One assumes that the deckhouse roof was removed before cargo was handled. The hull of the yathra was of a carvel construction using an unusual combination of stitched and nailed fastening. The planks, a minimum of 2” thick, were stitched to each other with coir rope and nailed to the frames with iron nails and roves. Accounts differ on whether the stitching holes penetrated straight through to the inner surface of the planks or exited on the plank edges. In any case, it is clear that the stitching served only to hold the planks against each other and not to the frames. Details on the order of construction are lacking, but one presumes that the planks were stitched first to make them tight, and nailed second. Joints were caulked with coconut husks and leaves inserted before the stitches were drawn tight. Stem and sternpost were fastened to the keel with hooked scarfs held with locking wedges. The frames and deck beams were few in number and widely spaced but of heavy scantlings, providing sufficient overall strength. Deck beams extended through the planking on both sides. Green says the frames were continuous from sheer to sheer, but given their scantlings and the hull’s shape, this seems impossible. Perhaps his information, which is not footnoted, stems from observation of a model which used continuous frames for expediency. 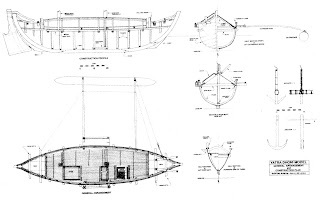 Tom Vosmer took careful measurements of the Dodanduva model, fed the details into a hydrostatics program, and found that the main hull, even without the outrigger, was “reasonably stable.” The outrigger, of course, significantly increased the vessel’s righting moment (by a factor of 100). It also increased drag, and therefore, the ship’s powering requirements. The rig, therefore, could have been smaller and simpler if the (still seaworthy) hull did not have an outrigger attached. Yathras were mainly short- and medium-haul cargo vessels, serving ports large and small throughout Sri Lanka and the Coromandel Coast and making regular voyages to the Maldives (550 miles from Colombo, Sri Lanka), although they also sailed at least occasionally to the Moluccas (3,600 miles). Typical cargoes included textiles, rice, salt, fish and fish products, tea, and tiles. A large one carried a crew of 18. The outrigger was always kept to windward except, perhaps, in the most benign conditions – an unusual and highly limiting practice for a tacking single-outrigger vessel. Working within these limits required coastal voyages to make use of the daily reversal of land and sea breezes: the vessel sailed only during the part of day when the prevailing breeze allowed the outrigger to be kept to windward. On longer voyages, the monsoon breeze dictated direction. This would have meant just a single round trip from Sri Lanka to the Maldives in any given year, whereas a vessel that could sail with either side to windward would be able to make several round trip voyages of that distance each year. Most accounts tell of the yathra succumbing to competition from steamships around the turn of the twentieth century. Vitharana claims that 40 of them were still serving Dodanduva in the 1930s, but all other accounts tell of the last one being built there to some fanfare in 1930; that is was wrecked on its first voyage in the Maldives; and that that was the end of the tradition. Fascinating that the ama was always to WW for the tacking boat -- an excellent reminder of how regional designs can be so wholly specialized to economic patterns and environment. It would be interesting to know if the limited trading schedule due to this sailing mode was at some optimum balance (and little understood by someone with a purely capitalist drive for more and more profit) with occupational patterns tied to non-maritime activities (farming and fishing for example) and sustainable resource use. Really interesting thought, Wade. I was thinking of it only in terms of its limitations, not that there might be a solid justification for it. Thanks for the wakeup.